1970 John Arnold - Wayne Lynch International Involvment Model 6 ft 4"
Foam blank with red Glue-line stringer, volan glassed with tint/pigment and 2/3 deck patch. 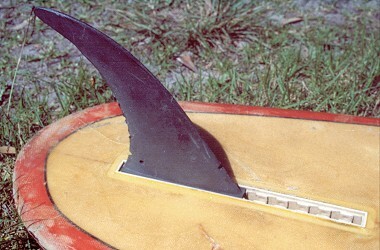 Slotted wedge adjustable fin box and companion fin. Black, moulded "glass filled nylon". Adjustable in a slotted wedge. When new, the system used several plastic locking clips that filled the exposed section. 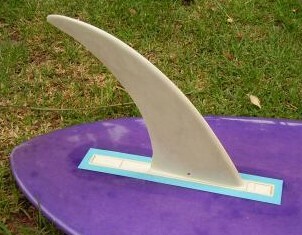 The fin and box probably manufactured by Simplex Fins, South Australia, see below. 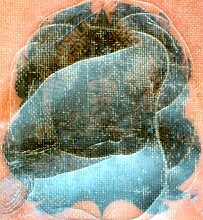 Similar designs were also used by Waveset and Guidance Systems in California, circa 1969-1970. The design was short lived and was replaced with now universally adopted Bahne box. Badly de-laminated, see alternative legible decal below. 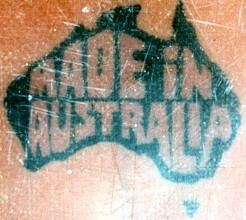 'Made in Australia' in black map, on tail. Deck: 6' 4" WAYNE LYNCH 2416 - pencil near tail. Bottom: clear with 1.5'' red laminated rail overlap and black 'pinlines'. Located in the Bronx, New York City, USA, the board was purchased from online in 2006 and despatched to Peter Hitchen, Martha's Vineyard, Mass. Peter kindly brought the board to Australia in December 2006. Many thanks to Calliope (the Bronx) and Peter. John Arnold Surfboards started in South Australia in the late 1950s and, principally through licensing O’Neill Wetsuits (USA) and Golden Breed clothing (USA), was a major company in the 1960s Australian surf industry. 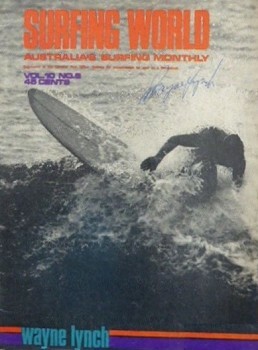 An advertisement for John Arnold Surfboards, late 1969 lists the shapers as Wayne Lynch, Wayne Dale and Sig Kwiatkowski. I assume Dale or Kwiatkowski were responsible for the majority of the Involvment production boards as Wayne Lynch had a number of interstate competitive committments and was also travelling the world with film producer, Paul Witzig. Presumably at this time the contract with John Arnold Surfboards had ceased. 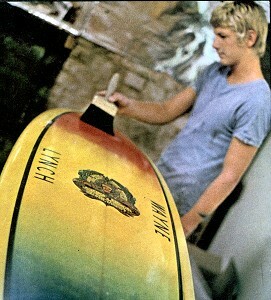 Wayne Lynch and Involvment model by John Arnold Surfboards, 1968. 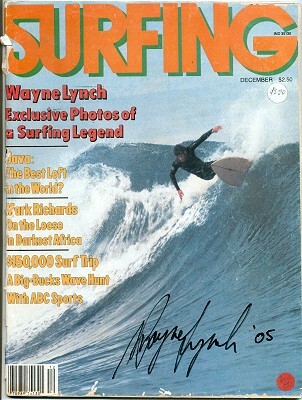 Said to have revolutionised backhand surfing, Wayne Lynch won the Bells Beach Junior Title 1966, 1967, 1968 and 1969. The Australian Junior Men’s Title 1967, 1968, 1969 and 1970; and the European Title in 1968. After an outstanding competitive record as a junior, he began shaping circa 1967, see below. In Evolution (shot over a period of 12-18 months), Lynch rides at least seven different boards, illustrating the rapid design changes in this period. Carter (1968) Cover photograph, with Keith Paull (going right). Paull was the 1968 Australian champion, Wayne Lynch the Junior champion. Nat’s Nat (1998) page 177, and following. Adelaide, South Australia, circa 1969. But it's inside that counts. 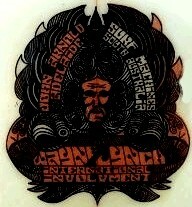 And it counts, when groovy guys like Wayne Lynch, Wayne Dale and Sig Kwiatkowski get together with the J.A. team. Time you started counting...into the 4th dimension with a Wayne Lynch 'involvment' model or a J.A. surf machine. Volume 2 Number 6, circa 1969, page 2. No bolts, keys or any hardware. So simple, the fin can be changed in seconds. The precision box allows six positions over a five inch adjustment span. 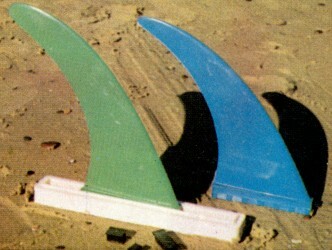 Three fin shapes in glass filled nylon, colours green, blue, red, yellow, white and black. 142 Gawler Place, Adelaide, 5000. Volume 3 Number 3, circa 1970, page 2. Adjustable fin and fin box with fore and rear locking clips. 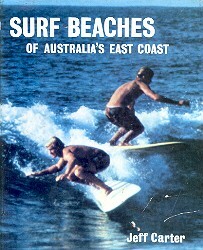 Burford Surfboards, South Australia, circa 1969. Contributed, with thanks by Mike Brown, Adelaide, January 2007. The Burford fin box and fin has no stampings. I reckon Don had these made up. My Arnold/Lynch boards which have the same setup are identical, but some fins have 'Made in Australia', others haven't. 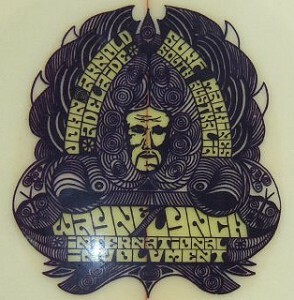 Early Wayne Lynch shaped board, (possibly the first) circa 1967. Features : Full vee-bottom, deepest at tail. Chamfered diamond tail. Note : Small square tail is obscured by grass. Fin appears to be in a box (possibly Fins Unlimited), or reset, or non-original. Geoff Cater (2000-2018) : Catalogue : Wayne Lynch Involvment, 6 ft 4", 1970.